Winner of the 2015 the Children’s Literature Association’s Phoenix Award, 1996 Council for Wisconsin Writers Anne Powers Book-Length Fiction Award, an American Library Association Best Book for Young Adults, and 1996 Hungry Mind Review Children’s Book of Distinction. Kyoko Mori portrays a mother and a daughter trapped by traditional values and gender roles in Japan in the 1970s. Megumi’s mother leaves her unhappy marriage and returns to her father’s home in an isolated weaving village, forsaking her daughter and refusing to see or speak with her until she reaches adulthood. Left in the care of a strict, critical paternal grandmother and an absent father, Megumi, a fifteen-year-old raised as a Christian, stops going to church. When she rescues an injured bird, Megumi meets a veterinarian in the neighborhood—a divorced woman who becomes her friend and role model. Megumi must ask questions for which there are no easy answers and learn to trust, love, and forgive again. 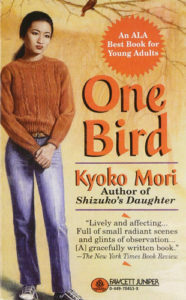 This gracefully written book involves us so immediately in the emotional and spiritual life of a 15-year-old Japanese girl that only rarely do we pause to register which aspects of Megumi Shimizu’s story are specific to her country and how much her experience has in common with the larger world of adolescence. . . . Without piety, obviousness, or self-consciousness, the novel integrates elements of Japanese culture. . . and shows us how they modify experiences and emotional states we all recognize, and remember. Stunning, evocative prose both sets scenes and shapes believable multidimensional characters in this well-crafted coming-of-age novel. The finest element here is neither the plot nor the characters, but the keenly observed atmosphere. It is the portrait of Japan, thoughtfully probed for its ironies, that will linger with the reader. – Publishers Weekly, starred review. 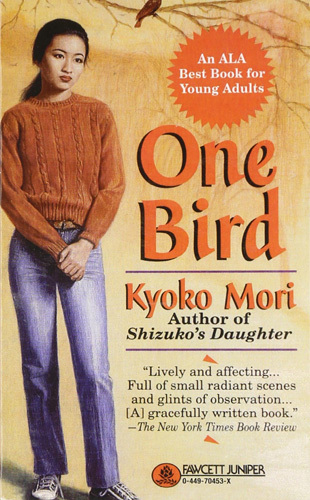 This entry was posted in Books, One Bird, Young Adult Novels on September 20, 1996 by Kyoko.